Here you have on the left, the new find/replace sidebar, allowing a far better search experience than the crappy over-the-top dialog. 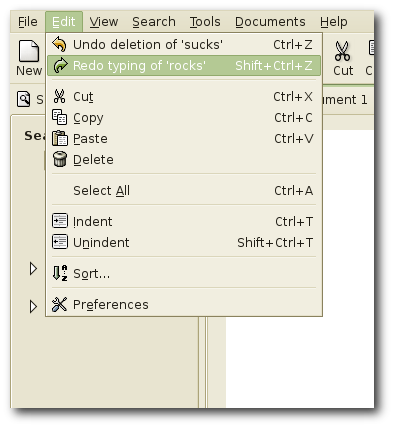 You can also see the context menu with interesting undo/redo labels, see next screenshot. 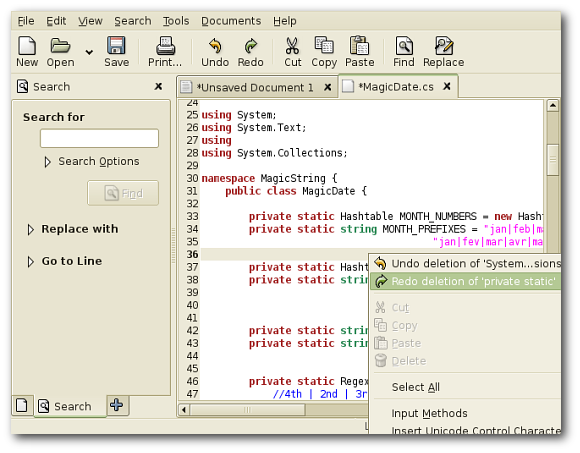 Again, the edit menu, showing the undo/redo items, like gnumeric and i suppose other applications, it shows a more comprehensible label than just “Undo” or “Redo”, that’s what i’m working on for the moment, you can follow it in this bugzilla bug, it is implemented in gtksourceview, so anyone using it should be able to have such menu items in his own app.